Spring is sprouting up all over. 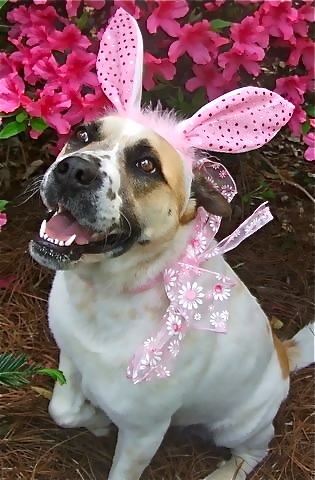 Lucy has just sent out her Easter greetings dressed in her finest bonnet and bow. Have a very Hoppy Easter! Lucy’s outfit was styled by her owner Holly. No doubt found the Faberge egg. I shall quit looking. Thank you Lynn, Miss Lucy is the most stylish dog ever! To you too! Love Miss Lucy! Lissy, your photography is so great…. what type of camera do you use? Yes she has—she is so photogenic.